The two men who have done the most to derail the carrer of Manny Pacquiao… one controversially, one chillingly… meet this Saturday in a bout that will tell us a lot about both men. It is some ways unfair to reduce both of these talented boxers to just their bouts with the Filipino superstar but there can be no doubt that it is their battles with Pac Man that to a large extent have defined their careers. Marquez’s four bouts with Pacquiao brought him from an underrated and little known Mexican boxer stuck in the shadow of Marco Antonio Barrera and Erik Morales to one of the most well known names in boxing while Bradley’s win over Pacquiao should have turned him from an underappreciated star of 140lbs to a superstar only for the controversy over the scoring to sour the entire episode. Both men turned down the chance to have another crack at Manny for this bout. So after this weekend, who will think that decision was somewhat foolish? At 40 years old “Dinamita” Marquez is surely close to the end of a career that has brought him success at featherweight, super featherweight, lightweight, junior welterweight and welterweight. His official record is 55(4)-6(0)-1 but many fans think it should be somewhat closer to 58-3-1 considering that a number of close decisions have gone against him. I don’t think that’s particularly fair but it does show how narrowly he’s been beaten even when he does lose. His record is highlighted by wins over Agapito Sanchez, former featherweight world champions Derrick Gainer and Orlando Salido, the previously mentioned Barrera, perennial contender Rocky Juarez, former unified 135lbs champion Juan Diaz, Australian warrior Michael Katsidis and of course his bouts with Manny… notably his draw in their first contest that brought him to the world’s attention and his crushing knockout in their most recent bout. Stylistically Marquez is a consummate counter-puncher with only the magnificent Floyd Mayweather Jr being able to claim he is the better practitioner of that style of boxing from this generation. That said Mayweather and Marquez go about counter their opponents in rather different ways. Marquez’s often looks to counter punch in combination, not looking to land a single shot and then slip away but instead to land in three’s and four’s to make the opponent back out. Despite being a counter puncher… a style normally noted for defensive solidity… Marquez actively looks to trade defence for offence; if the choice comes between avoiding a punch completely but robbing his counter of effectiveness or countering with a good shot but risking being hit himself he will inevitably choose to take a punch and counter well. That’s not to say that he’s defensively weak; his head and body movement is great, as is his foot placement, merely that they’re built around setting up his own shots, not negating his opponents. This combination has led to Marquez being in some entertaining wars (his first bout with Diaz was arguably the best bout of 2009), some stunning displays of skill but has also led to him being hit cleanly and dropped more (such as against Katsidis) more than you’d expect from someone with his talent. Marquez hits fairly hard and can drop opponents with a single shot but generally finishes opponents through hitting them cleanly multiple times as opposed to single shot power… unless a reckless opponent dives into a perfectly timed counter. Marquez has shown two real stylistic weaknesses over his career. The first only really applies to facing Pacquiao, but Marquez struggles early against fast and powerful boxers who can hit him before Marquez gets his timing down for his counters. Much is made of how Pacquiao struggles with Marquez… and that’s certainly true… but less is made of the fact Marquez equally struggles with Pacquiao, having been knocked down multiple times across their bouts, the knockdowns almost certainly costing him a couple of wins. Marquez also has difficulty when forced to out of his counter-punching style and made to come onto the front foot. This was most evident in his bout with Mayweather. Where Floyd potshotted Marquez from the outside, his defensive nous preventing Marquez from landing his own counters and then when Marquez started to press forward Mayweather picked him apart. Of course, that’s Mayweather and it’s harsh to overly criticise anyone for struggling against him, but I can also point to Marquez’s bout with Chris John for an example of him struggling when forced to set the tempo and come forwards. Some people think this bout was a controversial robbery, pointing out the fact it was held in Chris John’s home country of Indonesia but I suspect most people who subscribe to that view haven’t watched the bout itself; Marquez loses his accuracy and timing when he comes forward, John blocking and deflecting his shots while sneaking in his own punches. One should also recall the fact that Marquez had two (deserved) point deductions after his frustration got the better of him and he resorted to hitting John low. I thought the scorecards were too wide but that the result was just. Bradley is a decade younger than his opponent and as such should be in his physical prime. When Pacquaio demolished Hatton and then in turn left 140lbs Bradley grasped the mantle of being the best junior welterweight in the world (although never got the credit for it he deserved) and then came up to welterweight in pursuit of a bout with Pacquiao. 30(12)-0-1(NC) Bradley can point back to an impressive win over Junior Witter (who he beat in Nottingham to win his 140lbs world title), a unification victory over Kendall Holt, outclassing future 140lbs world champion Lamont Peterson in a grinding contest, another unification victory over Devon Alexander and of course his win over Pacquiao. Let’s get to the elephant in the room right away. I throw my hands up. I’m one of the very…very… very few who thought Bradley beat Pacquiao (115-113). I’m not ashamed of this in the slightest; I’ll put my scorecard up against anyones. I thought it was a close bout with a lot of close rounds and if the scores had been announced at the end as 116-112 Pacquiao I wouldn’t have batted an eyelid, thought it was a robbery or complained at all. It was an awkward and difficult bout to score and the judges scorecards (including the additional judges the WBO appointed after the fact) reflected this… at least one judge had Bradley the winner of each of 10 separate rounds. Regardless of who you thought won, in the cold light of day I think we all have to accept that it was a close bout and that Bradley did a good job of neutering Pacquaio’s offence. Stylistically Bradley is a jack of all trades with his game built around good technique, athleticism and a huge amount of stamina. His stereotypical style is to be a mauler, a cross between Hopkins and Hatton, leaping in from the outside (often leading with his head), clinching and then proceeding to rough up his opponent with grinding bodywork and some borderline illegal tactics, his stamina allowing him to keep this up for the full 12 rounds. It was this strategy that he used effectively to easily outpoint Alexander… albeit helped by a cut caused by an accidental clash of heads… a regular part of Bradley’s game. That said, Bradley has in various bouts used different tactics… against Peterson he was far more of a traditional inside fighter, against Abregu he was far more of a boxer/puncher and against Pacquiao he spent much of the bout as a counter puncher. This flexibility means someone facing Bradley won’t be entirely sure what style of bout they’ll face and Bradley can in turn adapt if something isn’t working. He has solid footwork and good upper body movement but he tends to leave his head (and thus his chin) a little static. Bradley has shown two main weakness across his career. The first is a lack of power. Since moving to world level with his win over Witter he’s only scored one stoppage (over a shot Casamayor) and while he’s had a couple of knockdowns they haven’t been particularly hurtful shots. He’s got enough pop to keep opponents honest but lacks the power to really hurt them. 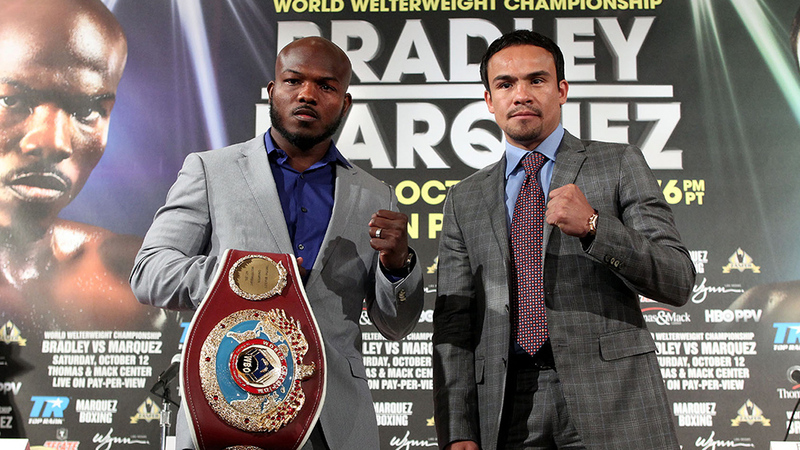 Any opponent facing Bradley can expect to be there for 12 rounds… 12 hard rounds but 12 rounds none-the-less. The second is that Bradley has a tendency to get a bit sloppy defensively. This is best shown in his bout with Holt… despite handily winning in the end, Bradley was knocked down twice… and both times hard. Holt, despite his deceiving stoppage percentage, his a pretty monsterous puncher and Bradley should be given credit for recovering so well from those blows but it’s still a poor sign (especially when going against a counter puncher like Marquez to leave those gaps). Jim Lampley was once reluctant to call for stringent measures to curtail the use of performance enhancing drugs in boxing. 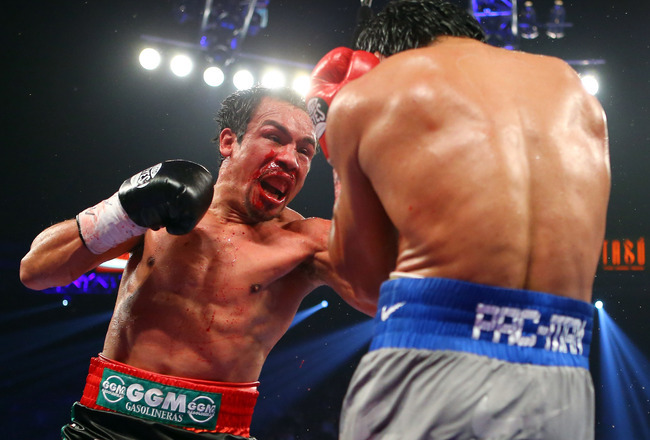 That changed on December 8, 2012, when Manny Pacquiao was brutally knocked out by Juan Manuel Marquez. One one hand this reveals Lampley’s fanboy like adoration of Pacquiao (something readily apparent from listening to him commentate on his bouts) in thinking that the only possible way that Pacquiao could be knocked unconscious by Marquez is if Marquez was doping (which is somewhat of a non sequitur anyway) when he had no objection to Pacquaio doing the same thing to Hatton in similar circumstances but he does get to the heart of the matter. 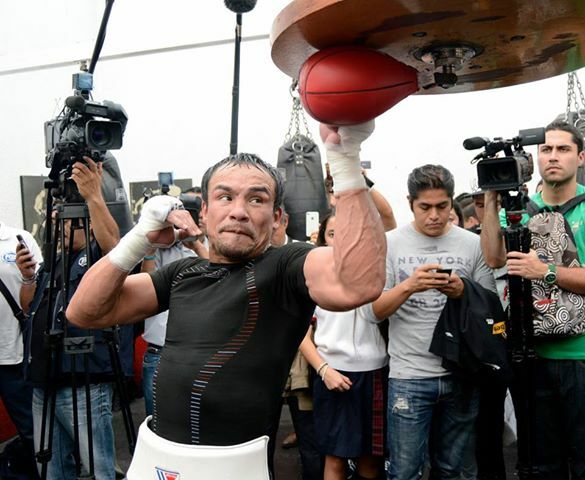 In Marquez’s first bout at 147lbs he looked soft and a bit flabby against Mayweather… come his next two bouts with Pacquiao he looked like Conan the Barbarian and looking at recent photos of him nothing seems to have changed. There are of course legal ways to build muscle mass but the fact that Marquez has been able to do it in his late 30’s and 40’s while keeping his speed and technique has raised eyebrows. As such the pair agreed to do a certain level of additional drug testing for the bout… but frankly it all became a bit of a mess before eventually being resolved. Beyond being a battle between two of the best 147lbs fighters on the planet (at worst between #3 and #4) what also makes this bout interesting are that both boxers have real questions to answer. Marquez’s are obvious. He’s 40 years old and 40 is pretty damn old for a welterweight boxer even in todays world. His win over Pacquiao was excellent and a stunning knockout… but in the euphoria of victory people sometimes forget that up to that point he wasn’t doing too well. Yes he’d scored a flash knockdown but he’d been knocked down himself and Pacquiao was generally having the best of it, making him look slow and… dare I say it… old. Pacquiao’s wildness and Marquez’s undoubted talent came together to give him the win but while it was a brilliant victory it was not a brilliant performance. And if Bradley mauls and grinds he has a style to make a fighter look incredibly old and tired. For Bradley the questions are twofold. First, can he get a win that is seen as legitimate over a top level boxer? Both Holt and Alexander (as well as Peterson with hindsight) were good boxers and held titles but neither were big names or near anyone’s pound for pound list and the bouts themselves were small events which had little wider interest. The bout with Pacquiao should have been his chance to change that… but the controversy of the result robbed Bradley of that. Secondly, we must look at Bradley’s last bout. Rather than take a big money rematch with Peterson, Bradley opted to face relatively unknown Russian contender Ruslan Provodnikov (himself set to take on Mike Alvarado in two weeks… a bout that should be high on excitement and violence). Personally I think Bradley should be applauded for that decision; it would have been very easy for him to take the money and win a meaningless rematch over an opponent he’d easily defeated only a few years previously but instead he opted for a dangerous and unheralded opponent. But what shouldn’t be applauded was the way Bradley went about the bout. Few people expected much from Provodnikov who had been exciting but shown nothing of real note in his few TV appearances. Most expected Bradley to outhustle and outclass him. But Bradley boxed… and I say this as someone who considers himself a fan of Bradley… like an idiot. The result was a thrilling, exciting bout that everyone should watch… but not one that Bradley should be proud of. I suspect Bradley was stung by the criticism he received after his bout with Pacquiao and went out wanting to make a statement. He talked about being a killer in the build-up, he mean-mugged anyone who would stand face to face with him, he wore light Reyes gloves which punchers generally prefer and he came out to brawl with Provodnikov, throwing all his technique, cunning and skill out the window. And the Russian was happy to oblige him. 1) Will Bradley be foolish enough to box in that way again? If he does, Marquez will happily oblige him by tattooing his face with counter shots for the entire night. 2) What will the lasting effects be. A beating like that can impact on a fighter and his long term health. We can all point to examples of boxers who have never been the same… Vargas after the beating he received from Tito for example or perhaps most infamously “Sugar” Ray Leonard deciding to finally face Hagler after seeing Hagler and Mugabe went to war and beat the prime out of each other. The signs haven’t been good… Bradley reported slurred speech immediately after the bout… and during the hype shows for this bout said it lasted for two months. That is a terrible sign for a boxer… terrible in terms of his career and much more importantly, terrible in terms of his future health. As someone who likes Bradley I’m not even sure I want to see him box again if that really was the case. I’m adding two caveats before my prediction. The first is that Bradley hasn’t suffered any serious lasting effects from the Provodnikov bout and thus has something left to give. The second is that he doesn’t come in thinking he’s Jake LaMotta reborn and try to brawl his way through Marquez. And with both of them in mind, I think Bradley wins. I simply think he has too many ways to beat Marquez. I think he if stays on the back foot, potshots Marquez and makes the Mexican come to him he can exploit how uneasy Marquez becomes when he’s made to take the lead. I think he can hit and move around Marquez, defend when Marquez does get into range and avoid the sorts of exchanges where Marquez thrives with his counter-punching. I also think that if he goes back to being the grinding, rough-housing Bradley he can win. This carries some danger as he would have to step into range of Marquez’s counters but Marquez is at his best when opponents throw more than one punch in the pocket, giving him his chance to set up counter shots and throw combinations himself. Bradley doesn’t… or at least didn’t… do that. He’d throw a single shot as he closed the gap (as well as leading with his head) then immediately clinch, get a hand free and start grinding away. Marquez simply wouldn’t have the time or the space to land the shots in the pocket that he’s so famous for and despite his knockout over Pacquiao I’m not sure he’s a reliable enough one-puncher knockout artist as an opponent comes in to be certain he can catch Bradley as he closes distance. And Bradley’s relentless grinding approach and bodywork is likely to be hell for a 40 year old’s ribs, however well conditioned he is. And Bradley can switch between the two if he needs, forcing Marquez to come forward one moment and then roughing him up on the inside the next. That’s not to say Marquez doesn’t have a chance. 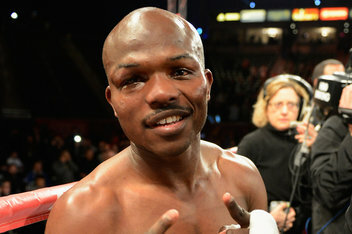 Bradley’s jaw may be gone from his war with Provodnikov and the first clean punch that lands may drop him. Even if he’s still as he was, Marquez could time another counter shot perfectly to detonate on his jaw as he steps in. Marquez may be able to use hit footwork to avoid Bradley’s leaping punches and set up exchanges that he can land his accurate counters from. But I think Bradley wins. I think he wins a drawn out, grinding affair which isn’t particularly exciting and where Marquez has his moments… but I still think he wins. Bradley by fairly comfortable decision. This entry was posted in Analysis, Boxing, Controversial Bouts and tagged Analysis, Boxing, Devon Alexander, Joel Casamayor, Juan Diaz, Juan Manuel Marquez, Junior Witter, Kendall Holt, Lamont Peterson, Luis Carlos Abregu, Manny Pacquiao, Michael Katsidis, Ruslan Provodnikov, Timothy Bradley by consortium11. Bookmark the permalink.